When people start thinking about getting a custom swimming pool and deck installed in their backyard, the first thing that pops in their head is the fun factor. There’s no question your family will get thousands of hours of fun with their new pool, but there are so many other reasons they should consider taking the dive and adding a pool to their house. These are just a few reasons why installing a custom swimming pool is a great idea for your family. Parents and kids come together to play pool games and they always have a blast. For some reason, the pool is an equalizer, making adults just as playful as their children, and games like Marco Polo and Freeze Tag are just a couple of the great games your whole family will want to play together. When you have a pool at your house, your kids suddenly have friends coming out of the woodwork. Their friends will all want to come over and play, and more importantly, your kids will want to stay home and play in their pool. When they’re home, your kids are much easier to keep an eye on. 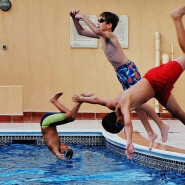 Having kids swim under supervision at home, they’re building up their ability to escape danger when they aren’t being supervised somewhere else. They’ll be safer at other people’s pools and in the ocean. They’ll even build up the swimming abilities enough to help save others in trouble. By going out and swimming in your pool, you’re automatically lowering your blood pressure, both with better exercise and by being more relaxed. From now on, birthday parties and anniversaries will be held at your house. Heck, just getting together for some sun, fun and margaritas with your buddies. Your family will play games, cook out, exercise and splash around – all together. If one kid gets in the pool, you know the others are following. And if Mom and Dad jump in, everybody’s jumping in! The first time you finish mowing your lawn or wrapping up some yard work, and jump into your custom swimming pool, you’ll wonder why you ever questioned it. It’s a great way to end a hard day of work, whether you worked in the sun or in an office. Swimming burns a ton of calories, and your body hardly even realizes it’s doing it because it’s so fun. Your joints will thank you, since swimming is so low impact. Your parents and grandparents will want to come over and do their water exercises. Have them grab an empty plastic jug of water and practice dunking it under water at various lengths away from their body. Again, the low-impact style of water aerobics makes exercise fun and less painful. There’s just something beautiful about a lit pool in the moonlight that helps mom and dad add some romance into their backyard. Add some cold beverages and some music, and you’ll have date night five nights a week. There’s no question that having a pool makes your home more attractive to homebuyers once you decide to sell and move away. Meanwhile, you’ll have spent years enjoying the pool. Finally, you’ll treasure all of the pictures and videos you and your kids end up taking during your time in the pool. From diving contests to someone’s first swim without floaties, you’ll have family memories to last you for decades. We think you’ll agree, after reading all of these reasons to own a custom swimming pool, that having a pool helps your family stay closer, stay healthier – and stay entertained! As colder temperatures approach, you’ll find yourself preparing your swimming pool for a lengthy winter slumber. While this generally means you won’t have to worry about pool maintenance or service for months, there are some things to consider doing before next year’s pool season. 12 couldn’t be more true. I have a lot of fond memories with friends and family from those summers we spent outside in the swimming pool. I’m definitely getting a pool for my kids when I get older. Thanks for a great aritcle! That’s a good point the kids like to go over to the house that has a pool. While we don’t have kids yet, it’s fun to see what things would be fun to use. At the very least, I could “lower my blood pressure” through a good swim. It’s been a while since I’ve been able to do swimming. There are so many good reasons to have your own pool for your home. You can make your own rules and you care for it so you control how much cleaner is in the water. I like that you can also watch your kids better than at a public place where it can be a little more difficult. This site is awesome because it lists lots of reasons that I didn’t think of for getting a pool. I’ve been trying to convince my parents that they should put a pool into their back yard for years. My dad just was told he needs to work on lowering his blood pressure so I might be able to use that reason to persuade them to finally get a pool. I will make them read this today and hopefully it convinces them of the need for a pool! Custom pools are really the only way to go. That way you get what you want. Of course you always want to make sure your pool is safe. Thanks for going over some of the advantages of having a custom swimming pool. I’m glad that you mentioned that having this could also help someone exercise better and still able to relax. As far as I know, swimming uses a lot of different muscles, so it seems like a great way to make sure that you get a full body workout. Plus, if you have it just outside your house, going out and exercising could be a lot easier because it’s literally on your property. I do like that you mentioned that having our children stay at home since we have a pool is a great deal for me. As you’ve mentioned, they would like to stay at home more and have their hangouts here while we know that they are safe since we can see them. I’d probably have one installed in our new estate then since we do have a large open area left there. I’ll have a few professionals to help with the installation of the new pool. Thanks!